Yes, it is cold out there. Winter has finally arrived—but don’t let that get you down. Go ahead, celebrate winter. Revel in it. Throw a party and make the most of it while it lasts. Spring will be here before you know it. Kids love it. If your child’s birthday is coming up soon, and you live in a place where the snow piles up, you’re in luck. You can have a great party outside in the snow, the kids will have a blast and unlike a trip to Disney world, you won’t have to spend much money. 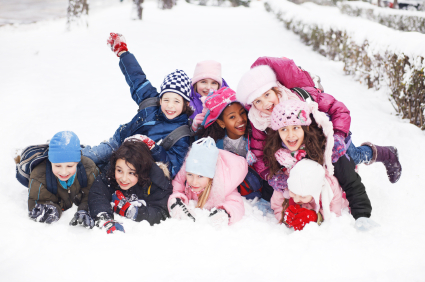 Even though the snow can be the bane of an adult’s existence, kids consider the snow to be fun, exciting, and full of opportunities. When dressed warmly, they don’t even seem to notice how cold it is outside if they’re in the middle of building a snowman or making snow angels. 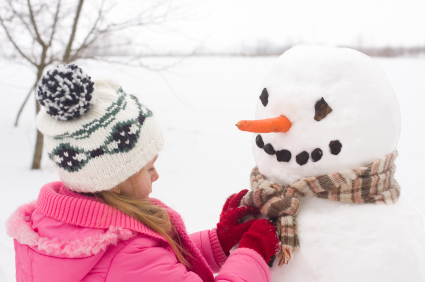 Have the kids form teams of two or three, and each team can try to build the best snowman. (You and the other parents at the party can be the judge of who wins). You may want to give the kids some buttons, carrots, and scarves to decorate their snowmen with. Kids could also bring some supplies from home like hats and brooms, if you let their parents know about the competition in advance. This is a particularly good idea if you’re throwing a party for young boys. Playing football in the snow is actually a lot safer than playing football any other time of the year. Piles of snow are generally a lot softer than the pavement. So, if kids happen to accidentally fall during the game, they can get right back up again and keep playing. It’s probably a good idea for you to have the kids play touch football instead of tackling football, especially if they’re on the younger side. The kids make snow angels, and the parents decide which one is the best. This is pretty similar to the snowman competition. When you hold any type of competition for kids, it’s actually a better idea to not offer some kind of prize or reward to the winner. Kids tend to get a little more upset about not winning if there’s a prize involved. Plus, forgoing the prizes saves you some money. Once the kids get tired from playing outside, you can take them all inside and have them make paper snowflakes using colorful paper. Kids love making their own snowflakes and taking them home as party favors. You could also have the kids draw snowmen and other winter characters. Having the kids make their own party favors is a great way to cut corners. Sound like fun? Consider your own version of the activities above, put on your best winter gear and get outside. This year, celebrate the best that winter has to offer and throw a snow party to remember for your birthday boy or girl this year! Lisa is a guest blogger and mom with many years of experience throwing everything from Super Mario birthday partys to a celebrity dress-up party on a budget. Throwing a birthday party? Need some help with ideas and solutions? You can get everything you need for a fun and memorable event from thePartyworks.